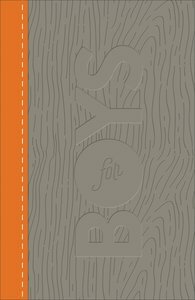 About "CSB Study Bible For Boys Charcoal/Orange Wood Design Leathertouch (Red Letter Edition)"
- Good Morning, God. Brief devotionals that encourage boys to read, think, and pray about their personal lives and relationships. - Genuine Heroes. Biographical sketches of men boys can admire and emulate. Men's World. Details what life was like for a man in Bible times. - Be All You Can Be. Challenges boys to act appropriately, make right decisions, and choose worthwhile values. Alongside the Christian Standard Bible translation, these features help boys discover a healthy and godly personal identity, guiding them past culture's deceptive stereotypes and into sound and successful relationships with God and others.